Public Justice’s new president, Michael Pitt, began his path to becoming a leading employment and civil rights litigator when he joined the free legal aid clinic at Wayne State Law School in the early 1970s. Although now ubiquitous in law schools, when Pitt joined legal clinics were just beginning to come online. The Wayne State clinic gave him a unique opportunity to work directly with indigent clients in the Detroit area, joining them at their kitchen tables to discuss cases. “As a young man coming of age in the turbulent 1960s, I needed something to quench my anti-establishment thirst. My free legal aid clinic did it for me. Every day I felt that I was helping someone get a landlord, debt collector or cop off the back of my powerless client. I am who I am today because of that experience. I represent individuals exclusively in their disputes with corporations, government and employers, and I’ve never deviated from that,” Pitt recalls. His dedication to helping people fight against larger and more powerful organizations has led to important results. Pitt and his fellow plaintiffs’ attorneys won Public Justice’s 2008 Trial Lawyer of the Year Award for their work in Neal v. Michigan Department of Corrections. They represented hundreds of women who were sexually assaulted, and in some cases raped by male prison guards in the Michigan prison system. The case ended in a $100 million settlement after two lengthy jury trials where jurors found that the department of corrections had violated the women’s rights and awarded damages. Pitt was recently named as Interim Co-Lead of the Consolidated Class Actions in the Flint Water Crisis Cases, along with Ted Leopold, Past President of Public Justice and a member of Public Justice’s Executive Committee. Pitt is especially passionate about the case because it is one of the very few that is about an injury to an entire community. He and his team have been engaging closely with that community, setting up a Flint office open for walk-ins and forming strong relationships with Flint community leads. “The Public Justice family is working together trying to get justice for the people of Flint. And having these great lawyers who are pursuing the case with the same vim and vigor that I’m pursuing it is really rewarding,” says Pitt. 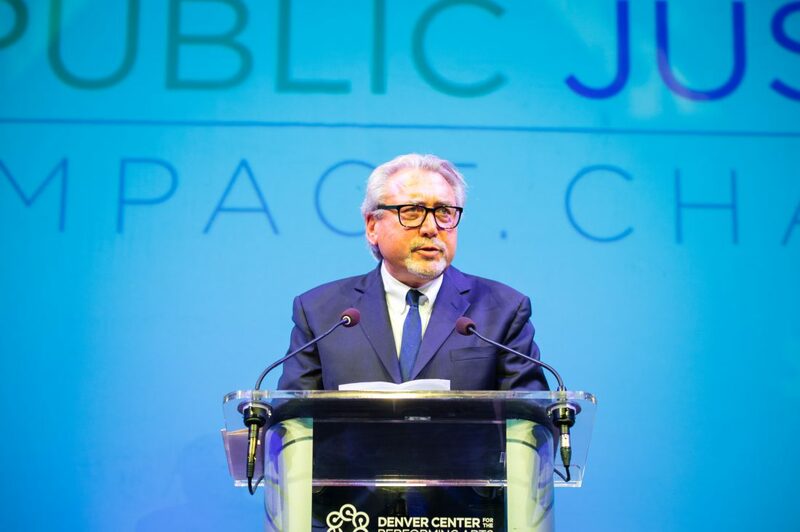 The most important connection between his practice and the docket of Public Justice, Pitt says, is the common goal of achieving social justice. As president of the Public Justice Foundation, Pitt is charged with guiding the organization’s litigation, fundraising and advocacy work while also leading the Public Justice Foundation’s Board of Directors and Executive Committee. He is especially interested in pursuing ways to express Public Justice’s commitment to diversity, both in its board and staff, as well as the types of cases that it takes. “We are so excited and honored to have a civil rights advocate as dedicated, passionate, and experienced as Michael Pitt guide our litigation and other activities in the coming year,” Public Justice Executive Director Paul Bland said of Pitt’s elevation to the presidency. Away from work, Pitt is dedicated grandfather to his four grandkids. He and his wife enjoy to travel, and are avid bike riders.